With an 11-piece band on stage, there’s room for chaos. 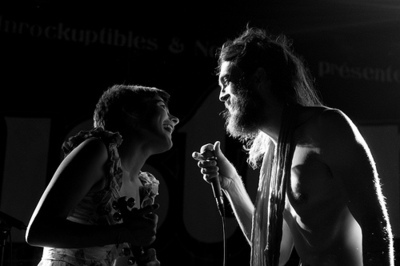 I was warned before hand that the gypsy, jangly troupe making up Edward Sharpe and the Magnetic Zeros weren’t so hot live. On Saturday, May 12, I went into the Orpheum Theater without great expectations, and left in awe. From start to finish, this group of talented multi-instrumentalists managed to transform a concert hall into one giant musical love-in by whole heartedly embracing its audience. Frontman Alex Ebert (formerly of Ima Robot) says he tries to evoke his inner child in his music. Looking around the crowd at the sold-out show, it was clear the audience caught that vibe as the whole room danced, played and laughed like kids on a sugar high. Opening with a song off their soon to be released album, Here, the band launched into “Sing a Song,” a soaring number that didn’t skip a beat. Mixing up old and new, they followed up with “40 Day Dream,” triggering a joyous audience sing-along. Ebert, barefoot and sporting his signature burly beard, strutted around like a lanky, doe-eyed Jesus, sometimes with a straw hat atop his head. His white clothes, shirt hanging slightly off one shoulder, made him look a little like a grown-up version of Max from Where the Wild Things Are. He continued to slip into the audience throughout the night, dancing with, talking to and hugging adoring fans. The music takes on the celebratory and intense air of a revival show, with Ebert and the powerhouse vocals of Jade Castrinos leading the parade march. But the band’s sense of family also lends to an intimate feeling — one that conjures the vibe of relatives picking together on the front porch. And everybody passing by is welcome to join the happy hoedown. Castrinos is hands-down one of the best female singers around right now. This petite woman delivers vocals far more beefier than you’d expect. Think Grace Slick and Janis Joplin with a little Linda Ronstadt mixed in. This is one group of hippies you can’t help but love. Ebert has a lot to celebrate. The band’s first studio album, Up From Below, was released in 2009. Around the same time, Ebert ditched alcoholism and wrote a book on this messianic alternate persona of Edward Sharpe. Love was the theme all around Saturday on stage and off. When Ebert and Castrinos lock eyes and sing to each other, you can’t help but think of Johnny Cash and June Carter. Well, if Johnny were a towering figure with a grizzly beard and no undershirt. Songs from the new album ranged from folk and country to rock and psychedelic, and by the sound of what was heard in Boston Saturday, the band’s second studio album promises to be a big hit. Band member Christian Letts performed a beautiful new ballad, “Child,” with a smooth and slow country sound. The new radio single “Man on Fire” is a slow ballad-turned-upbeat sing along. When Ebert sang “Only one desire that’s left in me, I want the whole damn world to come and dance with me,” that’s just what the crowd did. But it was the whistling that really made the Orpheum audience go wild as the band went into their big hit, “Home” and Stewart Cole blasted a trumpet solo worthy of a queen’s entrance. As Castrinos belted out the lyrics “home is wherever I’m with you,” and the whole room sang it with her, it was clear in that moment that’s where we all were. In the house that Edward Sharpe and the Magnetic Zeros built, you can’t help but be overwhelmed by the thought that human beings can be pretty awesome sometimes. 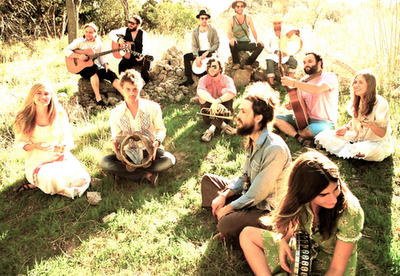 Edward Sharpe and the Magnetic Zeros’ second studio album, Here, will be released on May 29.